Until April 23, 2015, when the martyrs of the Armenian Genocide were canonized, Gregory of Datev (Krikor Datevatsi) was the last saint of the Armenian Church. A frieze of St. Gregory of Datev located on the exterior of Holy Transfiguration Cathedral in Moscow, Russia. Krikor Datevatsi was born in 1346 in the district of Vayots Dzor, in the province of Siunik (southern Armenia). At the age of seven, his parents sent him out for education. 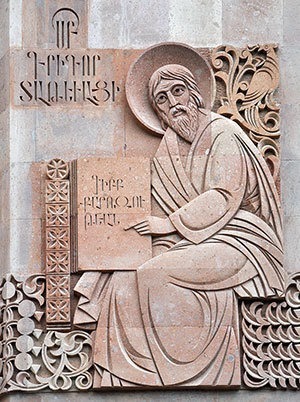 He later continued his education in the famed University of Datev, where he was a disciple of Hovhan Vorotnetsi (1315-1386), another saint of the Armenian Church commemorated on the twentieth day of the Great Lent. In 1371 Krikor and his teacher went in pilgrimage to Jerusalem, where the 25-year-old student was consecrated celibate priest. On the way back, Krikor was ordained vartabed and received the doctorial staff from Vorotnetsi. The Matenadaran preserves a Bible copied in 1297, which Datevatsi illustrated in 1378. Two years later, teacher and disciple moved to the convent of Aprakunis. After the death of Hovhan Vorotnetsi in 1388, Krikor became the head of the convent and gave courses of philosophy, theology, grammar, musical theory, and other subjects. In 1390 he returned to Datev and congregated many students coming from various areas of Siunik and Armenia in general to continue his educational activities. His hundreds of students, among them famous writers like Tovma Medzopetsi and Arakel Siunetsi, played a remarkable role in Armenian cultural and religious life. 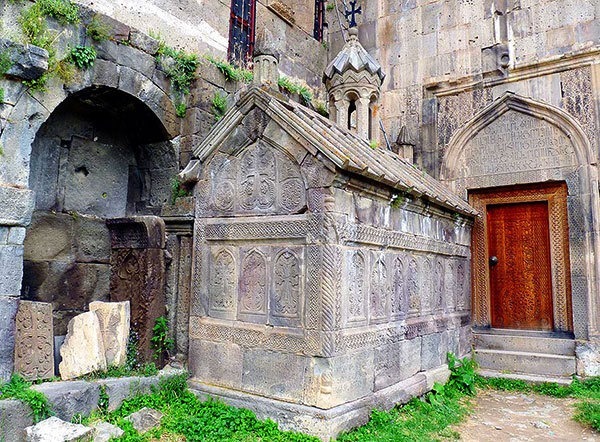 St. Gregory’s mausoleum located adjacent to St. Peter & Paul Cathedral at Datev Monastery in the Siunik province of Armenia. During his tenure, the University of Datev reached the pinnacle of its flourishing as a center of science, culture, art, and spiritual life. It had three schools (philosophy and theology, calligraphy and manuscript illumination, and music), where they taught philosophy, religion, Armenian language and grammar, literature, history, rhetoric, manuscript copying, miniature painting, natural sciences and astronomy, mathematics, architecture, music and singing, pedagogy and social sciences, and other subjects. Studies lasted seven to eight years. The university had a rich library, with more than ten thousand manuscript books. The monastery would be totally destroyed and set to fire by Shahrokh, youngest son of Tamerlan, in 1435. Krikor Datevatsi left an abundant corpus of works, including sermons, commentaries of the works of Aristotle and David the Invincible, and theological works. The most important of his works was the Book of Questions, a sort of encyclopedia that has been compared to the works of Western theologians like Thomas Aquinas and Albertus Magnus. This book also contained a critique of the doctrines of the Catholic Church, since Catholic missionaries had entered Armenia since the fourteen century and created the Armenian branch of the Dominican order, called Fratres Unitores, with proselytizing aims. He also wrote a book of sermons divided into two parts, For the Summer (Ամառան) and For the Winter (Ձմեռան). 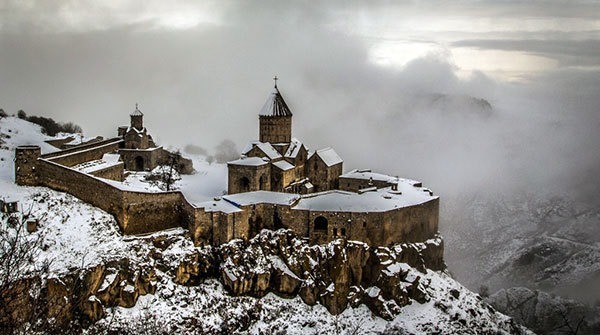 Datev Monastery above the Vorodan gorge in wintertime. In 1408, apparently due to the political unrest after the death of Tamerlan in 1403, Datevatsi and his students moved to the monastery of Medzop, near Lake Van, but returned to Datev after a year. The great teacher and writer passed away on December 25, 1409, after a short illness. He is commemorated by the Armenian Church on the Saturday before the fourth Sunday of the Great Lent. The cultural and religious stature of Datevatsi earned him a place among the twelve statues (the second to the left) surrounding Mesrob Mashdots and his disciple Koriun on the front of the Matenadaran, the library of manuscripts in Yerevan. The St. Gregory of Datev Institute, founded in 1987 by the Armenian Religious Education Council (AREC) under the aegis of the Armenian Prelacy, has also preserved the memory of his name.